The objective of the book is to make accessible the ways in which social network analysis (SNA) may be used to observe, monitor and analyse systems and relationships in major construction project coalitions. Although this has been an established analytical technique in the US for some time, it is only now being developed in the UK. 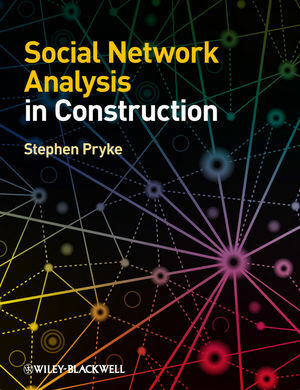 Having spent nearly two decades investigating major project relationships using SNA, the author has brought together mathematical and sociological methods, and major project relationships in a manner that will inspire both academic interest and a desire to apply these concepts and techniques to live construction projects. Case studies include projects from two of the UKs largest property developers, the UK Ministry of Defence and a County Council. SNA is innovative - but potentially inaccessible to project management analysts and practitioners. This book will provide clear and relevant explanation and illustration of the possibilities of using SNA in a major project environment. In addition to offering the potential; for sophisticated retrospective analysis of a wide range of systems associated with construction and engineering project coalitions, the author looks at how we might apply the network analysis findings to the design and management of project and supply chain networks. Dr Stephen Pryke is a Senior Lecturer in Project Management at The Bartlett School, University College London and Director of Studies for the MSc Project and Enterprise Management programme there. He has published a number of books and papers in leading research journals dealing with supply chain management, social network analysis and the legal aspects of procurement reforms in the UK. His work has been presented to a number of international research conferences and his work on procurement and project management systems in France and China has been published by the RICS. He has provided project management training and consultancy to a number of major European companies and is a consultant to Durland Consulting in Chicago, USA. Prior to entering academia in the mid 1990s, he ran his own consultancy and held a number of senior project management positions in both the public and private sectors within the UK.